Traumas can come from all parts of your life and to different degrees – but in sports we are particularly exposed to trauma from injuries, defeats, humiliations. This is often overlooked in psychology for athletes. Even if you don’t really consider yourself traumatized, it is worth knowing that any deeply distressing or disturbing experience is a trauma. It is stored in the brain subconsciously with all its connected emotions, leaving you with an imprint that can come back to destabilize you and cause a lot of trouble when you least expect it. Our guest in this episode (Phil Johnson, whom you might have already met in part of the Sports Psychology for Athletes series where we talked about performance anxiety) is going to tell you much more about that. We learnt from Phil Johnson in part 1 of Sports Psychology for Athletes, that the impact of unresolved trauma manifests in our belief system – often limiting us to certain assumptions about what we can and cannot do. This wires you with a series limiting self beliefs or barriers to performance that your brain has constructed on your journey for each trauma– often without you realizing it. It originally served the noble purpose of protecting you from another similar trauma. The problem is that this mechanism spills over in other areas where it might not serve you well at all. Areas where you don’t want to feel limited. Like in your sport. Phil Johnson works with a tool called brainspotting and in this episode he will explain how it works – and how that can actually help you with things like performance anxiety, dealing with and healing from injuries and trauma and even to getting in the zone for optimal performance. 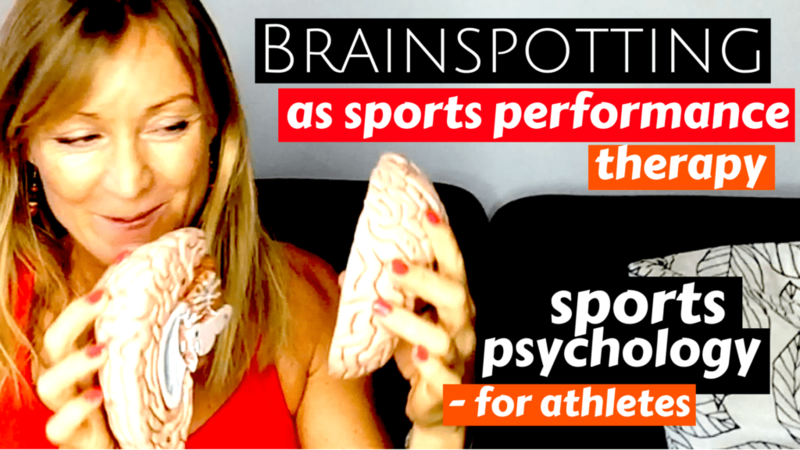 Brainspotting is a method for healing trauma in sport and in life. The method was actually developed in a sport psychology session between a figure skater and the therapist who was helping her get unstuck with a certain jump that she couldn’t seem to learn – causing her a lot of trouble and preventing her from moving on in her sports career. The day after the session she could do that jump and hasn’t had any trouble with it since. Now, does that sound like something that you can use as an athlete!? Well, I would have loved to have known about it back when I was competing! Well you can start with some notes. I will gladly share my own notes with the main takeaways from this episode. You can get them here where you can also read a full transcript of this episode. It has been discovered that your vision – where you look – scans not only the external surroundings but also your what’s going on in your brain. Looking at a certain external spot will take you to a corresponding internal spot in your brain where you have a certain emotional energy trapped as the result of a past experience. By keeping your vision focused on this spot, you keep your brain focused on the corresponding internal spot that holds that emotional energy or subconscious memory, if you like. This allows you to process it and release it. In this process of resolution, new neuro-pathways are created, literally re-wiring you. And allowing you to break free of these limitations or barriers. On the other hand if we go to an eye position related to a confidence boosting emotion, we can harvest this energy in stead of letting it go. Feel free to reach out if you have any questions or anything you’d like me to cover – and of course if you like this show, don’t forget to subscribe, leave a review.and share with fellow athletes and coaches. “Your brain triggers a previous memory. Subconsciously. And that’s what actually directs your behavior in that moment. It’s not necessarily the very thing that’s happening. And so when we go back and we desensitize that memory, there is nothing left to trigger. Where you look affects how you feel. Brainspotting is a tool that can be used to re-wire such a self limiting belief system. On the other hand, it can also be used to enforce feelings that are actually encouraging and conducive to what you want to achieve. While the limiting feelings come from traumatic experiences, the conducive ones come from experiences of success and feeling great and on top of the world.